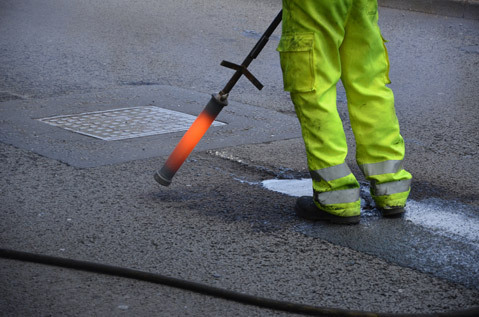 Part I : A hot applied, polymer-modified bitumen compound incorporating fillers, high PSV aggregates and fibres for infilling and sealing cracks and joint recesses. Part II : An overband component consisting of a thermoplastic resin and high PSV granite to provide a skid-resistant wearing surface. TexBand (Part II) is manufactured in Standard and High Friction (HF) performance levels. 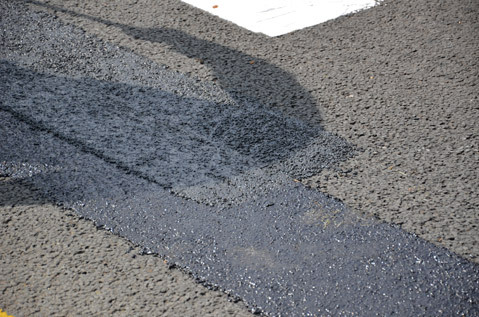 TexBand HF contains calcined bauxite, and can be used to repair and restore Clause 924 Type 1 High Friction Surfacing. TexBand system repairs cracks, seams and joints in all black-top surfaces up to 40mm. The over-banding component is applied at band widths of between 100mm and 150mm. 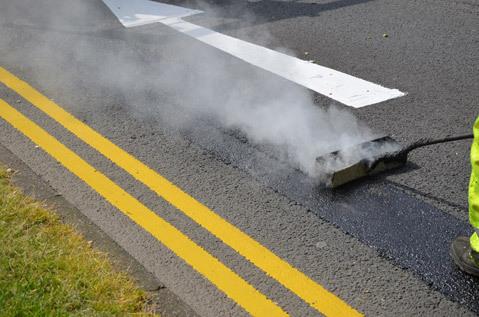 It is suitable for use on all asphaltic road surfaces. The standard colour for TexBand Part 1 and Part 2 is black. TexBand Part 2 over-banding material may be supplied in alternative colours including buff, red and grey, however it is important to note that traces of the black component may be visible. TexBand should be applied according to the relevant HITEX Method Statement. It can be trafficked once it has cooled to 35°, typically 15 minutes after the final application. This period may need to be extended in very hot weather. 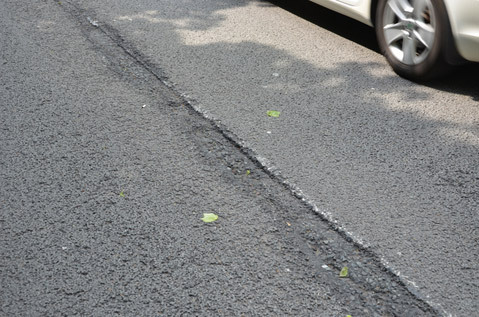 Cracked road surface is identified. First the surface is cleaned with a Hot compressed air lance. The cleaned surface is treated with a 40 mm screed shoe applicator. An overband is applied with the 150 mm shoe to completely seal the crack and provide a bump-free seal and a smooth patch. TexBand is a CRRI approved, IRC accredited product. 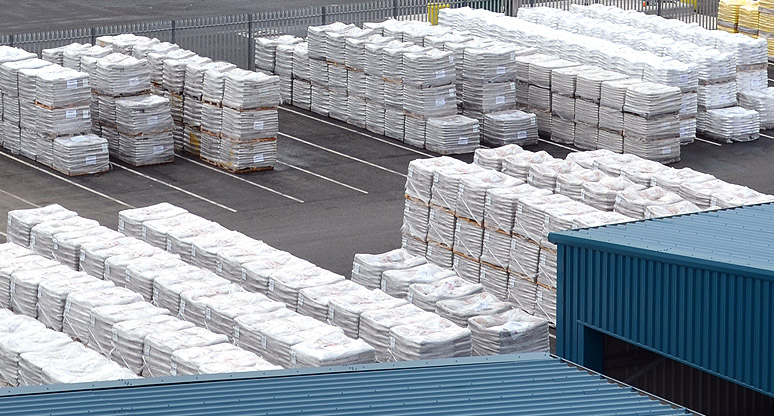 TexBand Part 1 is supplied in 20kg silicone-lined multi-ply bags, 50 bags per tonne pallet. TexBand Part 2 and TexBand HF Part 2 is supplied in meltable polyethylene bags of approximately 25kg each. The bags are packed onto pallets of 40 bags, and supplied in lots of approximately 1 tonne per pallet. Finished pallets are shrouded and stretch-wrapped for protection. It is recommended that Hitex TexBand product should be kept totally dry and stored away from direct sunlight and areas of potential contamination. For further information consult the relevant Safety Data Sheet (SDS).